Despite the long protest march earlier this year to stop the plant and protecting the Sundarbans forest, on July 12, 2016, a contract was signed to finally install the plant. Sundarbans is the natural habitat of famous ‘Royal Bengal Tiger' and the halophytic mangrove forest in the world. Due to its natural flora and fauna, UNESCO recognized Sundarbans as World Heritage Site in 1997. This nature’s wonder is under threat because of a recently proposed 320-MW thermal power plant to be established near the Sundarban at Rampal. In 2010, the Bangladesh India Friendship Power Company Ltd, a Bangladesh-India joint venture between the state-run Power Development Board (PDB) of Bangladesh and India's National Thermal Power Corporation (NTPC), decided to set up the plant at Rampal at a cost of $1.5 billion; PDB and NTPC will implement the project on a 50:50 equity basis . Of the total project cost, 70 per cent will arranged through loans and the remaining 30 per cent will equally be shared by the PDB and NTPC . Land acquisition process was initiated in December 2010. Although the government is assuring that the coal-based project will be constructed using modern technology and will be less polluted, activists argue that as the power plant located very close to the Sundarban will certainly damage the natural habitat of Sundarban jungle . Even before the Environment Impact Assessment (EIA) was done, 1,834 acres of land was acquired for the project. The land was mostly agricultural and for shrimp aquaculture pond (gher). The people of that locality solely depend on the agriculture and shrimp culture for their livelihood. So, people do not want to give their land for the project. The land acquisition was forcefully done by the government without the consent of the people . The activists pointed out that the contract for the power plant is non-transparent and unequal many alleged that Indian government will be more beneficial than the Bangladesh. This is also one line of protest among the Bangladeshi people that Bangladeshi Government is sacrificing its people’s interest [3, 4] Also, different studies have observed that the project would severely affect the natural habitat of Sundarbans. Many scholarly studies found the proposed coal fired power plant as the destroyer of the largest forest in Bangladesh [3, 5]. The project is objected by people from different corner of both India and Bangladesh. In September 2013, many people from Bangladesh under the banner “National Committee on Protection of Oil, Gas, Mineral Resources, Power and Ports” organized a long march to protest the construction of the thermal power plant . UPDATE July2016: Despite the long protest march earlier this year to stop the Rampal coal plant, and protecting the Sundarbans forest, on July 12 2016 a contract was signed to finally install the plant. Since then, the protests have started again in Bangladesh. In India too, there have been protests and mobilizations against the construction of the thermal power plant in Rampal in different parts of the country. However, the strongest anti-Rampal Solidarity Network in India is in West Bengal, which will have a direct impact because the Sundarbans are a continuous stretch of mangrove forest, with 40% of it falling on Indian ground. In October 2017, during the 5th National Coal and Thermal Power Gathering in Dhanbad, Jharkhand, activists from West Bengal stressed the importance of Sundarbans as a shield against cyclones, and a source of subsistence for the local communities on both sides of the border. Ironically, all the major players involved in the development of the Rampal project are Indian government-owned entities. However the government sources claimed that the power plant will use modern technology so that pollution level can be minimized. Also the plant authorities ensured the protection of the mangrove forest and environmental management . Development of Alternatives The protestors request the government to explore alternative site and means to generate energy without destroying the Sundarbans . According to the protesters, discharge from the plant like fly ash and Sulphur dioxide will have disastrous consequences for the fauna and flora of the mangrove forests. The protesters say the plant is not merely dangerous for the Sundarbans' ecology but it also poses threat to local livelihoods. They demanded the Rampal Thermal Power Plant project in Bagerhat, just 14 km away from the Sundarbans, be shelved forever . According to the protestors that ‘there are many alternatives for power generation, but there is no alternative for Sundarban.' They also ask Indian People to join them to save this World Heritage Site . Why? Explain briefly. 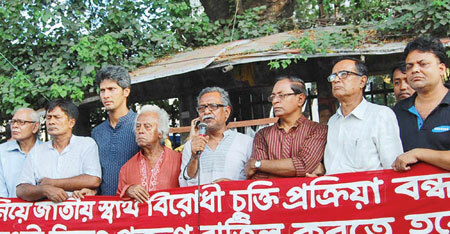 Activists have pointed out that the project is a gross violation of Environment Conservation Act (1995) of Bangladesh. Also before the Environment Impact Assessment (EIA) was done, 1834 acres of land, that was mostly agricultural and shrimp aquaculture pond had been acquired for the proposed 1320 MW power plant project. That was done by the government without the consent of the people by using police force and local goons . For the EIA local people experts and concerned citizens opinions were also not taken. UPDATE July2016: Despite the long protest march earlier this year to stop the Rampal coal plant, and protecting the Sundarbans forest, on July 12 a contract was signed to finally install the plant.